According to Greg Peek “it is generally accepted that the old style headrest hardware using a ball and socket does not stay in place, it slips and moves, the more you tighten it, the more it moves. There have been many attempts to improve on it with different methods of clamping, but with little success.” Greg’s solution was to eliminate the part that doesn’t work, the ball and socket and replace it with a multiple disc finger joint with a huge amount of surface area to clamp. Greg Peek loves to design the indestructible. After all, we see some tough clients! 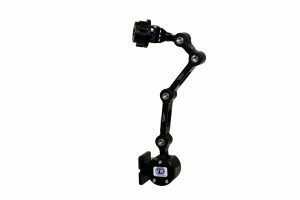 He has designed mounting joints for static and dynamic head supports that provide a large degree of adjustment while maintaining position. To fully appreciate how this works, we have to look at some math (sorry about that). Rigidity and resistance to joint slippage is a function of clamping surface area. Now I’m not an engineer. So, what do all those numbers mean? Well, the more surface contact there is, the less likely the joint is to slip. Seating Dynamic’s hardware has over 3 times the surface area contact, so it holds it position. Efficiency has to do with the use of space and volume – a ratio of the clamping area compared to the size or volume that the joint hardware consumes in space. The cone style is 43% the size of the standard 1” diameter ball and has 1/3 of the clamping area, so it doesn’t maintain its position as well. The Seating Dynamics finger joint is 59% the size of the standard 1” ball, yet has 3.48 times the clamping area, allowing this hardware to maintain its position very well. Even the design of head support mounting hardware can determine whether a client can maintain head alignment. Are you working with clients whose head support is constantly moved out of position? A dynamic head support can absorb client forces and keep things in alignment. In addition to the dynamic feature, the mounting hardware design can maintain alignment of the head support by increasing the clamping area. Thanks for the detailed comparison of hardware options for head support on difficult clients. Very useful. Thanks Missy, I hope it helps you out!